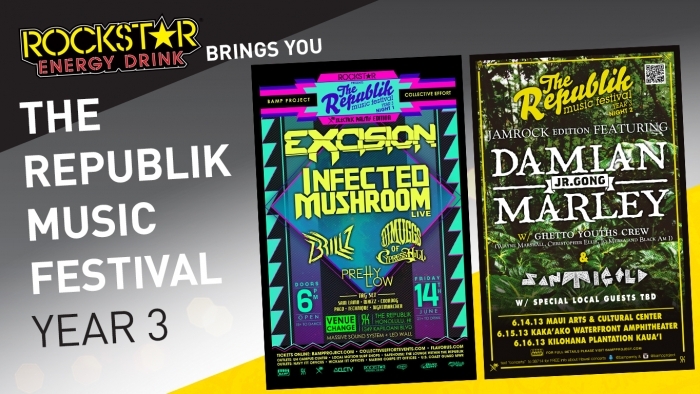 Rockstar Energy Drink presents The Republik Music Festival: June 14-15. In celebration of the opening of Hawaii's newest concert venue, this name sake festival has grown to encompass everything that the Republik Concert Hall represents. This means expanding the festival in year 3 to make room for all the eclectic performers over 2 days. Day 1 of the Republik Music Festival will be the Electric Palms Edition featuring Excision & a special live set by Infected Mushroom with special guests Brillz & DJ Muggs of Cypress Hill. Day 2 of the Republik Music Festival will be the JAMROCK Edition featuring Damian Marley & Santigold with special guests. For more info go to http://www.bampproject.com.